Mark Ollinger's work is best summarized as an investigative approach to the visualization of a lifespan, using "maps" that consist of mazes intertwining and reconnecting in an unbroken loop. 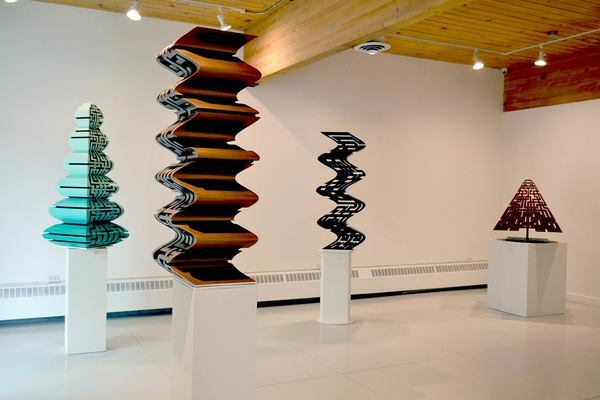 Mark's work is concerned with exploring ways of physically realizing, through sculpture, the way we examine the linear progression of time within an individual life. The weaving in the maze symbolizes the specific occurrences or occasions that we use as reference points while considering time past or anticipated - landmarks one refers to while reflecting upon a lifetime. The works look at ways we conceptualize and express this abstract passing of time. A singular line folding both over and under itself references a balance of experiences, with both positive and negative occurrences achieving an equilibrium and symmetry within the work. Recurrence of this weaving creates meeting places of complexity, which mirrors the complex positions or experiences in which we constantly navigate. The work aims not to focus on a starting place or an end, more a cyclical and continuous unfolding of time throughout common human experience. The art embodies this idea in both a micro and macro scale, the former being the daily routines that we find ourselves looping continuously through and the latter, which consists of a larger, more complex loop encompassing an entire lifespan but similarly coming back around. A more expansive way of viewing it is the comparison of micro particles to larger bodies all existing on a mathematical plane, all constantly moving and reacting to each other. These collisions weave a fabric through a collection of occurrences, with one life being a small path throughout. The use of a line to describe experiences is the simplest way of demonstrating this idea as we constantly and repetitively see time and space described in a directionally linear way through countless examples, including calendars, historical timelines, charts, compasses, transit and roads, or depictions of natural systems. The work is primarily concerned with this concept, rather than being bound to a specific medium. Much like the idea of a line being a symbolic description of time, written language also symbolizes abstract concepts that are experienced throughout one's life. The words built into the line and hidden within the sculpture describe how these abstract ideas build and form the framework to help shape an individual path. Graffiti recognizes and highlights words having potential as an autonomous objects, ones that have contingent understanding and that each individual has a unique relationship to. Graffiti initially informed this interest in how a singular word can be a stand alone work in itself, and how contextually the meaning can change based on the viewer. Communicating through sculpture, Mark's work aims to start a conversation about how we view the passing of time, and examines how we all uniquely understand it.